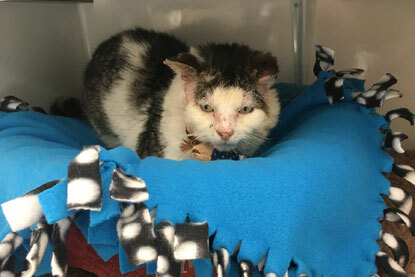 Fergal, the cat reported to Cats Protection’s Chiltern Branch as a ‘mean and ugly’ stray, has been rehomed after becoming a social media superstar. 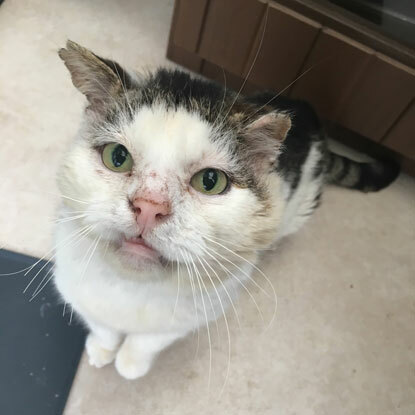 ﻿The tabby-and-white cat had become known locally for his swollen face and tendency to fight, and was found in a sorry state on the streets of Chesham where it’s thought he had been for a number of years. 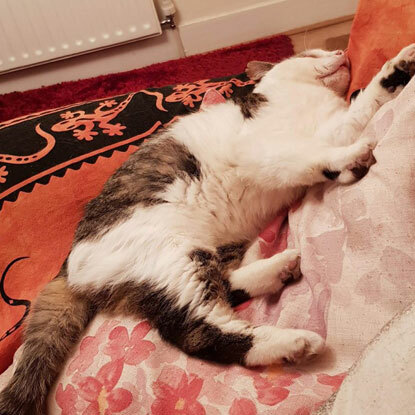 The Chiltern Branch collected him and took him to the vets, where he was treated for weeping abscesses on his face, had broken teeth removed, was neutered and diagnosed as FIV positive. Once back in the charity’s care he became the focus of the @ChilternCPCat Twitter feed, and his battered appearance and hard-luck story soon won him many loyal fans. He racked up a sizeable 3,095 followers and messages from Argentina, Finland, India and the USA filled the account’s inbox. Monetary donations totalling £1,247 covered the poor puss’s vet bills, with the remainder used to help other cats in the branch’s care. Food, treats, toys, blankets, brushes and more also arrived from donors around the globe. Slowly, Fergal began to grow more confident and began accepting fuss and cuddles, but despite his fame, he was overlooked by many potential adopters who were deterred by his unconventional appearance. However, one man who was not put off, Chris Elliot, eventually took Fergal into his home. Chris wasn’t aware of Fergal’s Twitter fame when he decided to adopt him, but was touched to hear about the love he has been shown online. 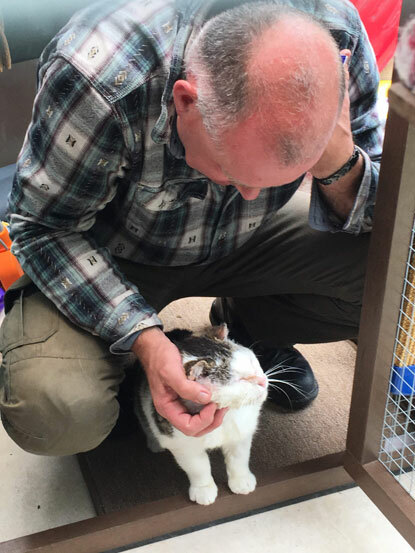 He said: “It’s unusual having a celebrity cat but lovely to know so many people across the world love him as much as I do – we still have so many gifts and toys to rediscover and enjoy now that he is a bit more settled and is starting to play. To find your own feline friend like Fergal, visit www.cats.org.uk/find-a-cat to see the cats looking for homes in your area. beautiful feline. all he wanted was love. From Chile, love and blessings for both. What an uplifting story. Well done Chris for giving back. Many people become hardened when life is less than kind. Respect for never losing your humanity. Be happy with chris. I miss you on Tweeter. Just goes to show that mutual love has nothing to do with physical appearance. seeing Fergal stretched out asleep, like that warms the heart, he must have thought he had gone to heaven. We are glad he has found a happy home. Wonderful story! Thank you, Chris, for loving Fergal! Why is chocolate poisonous for cats?